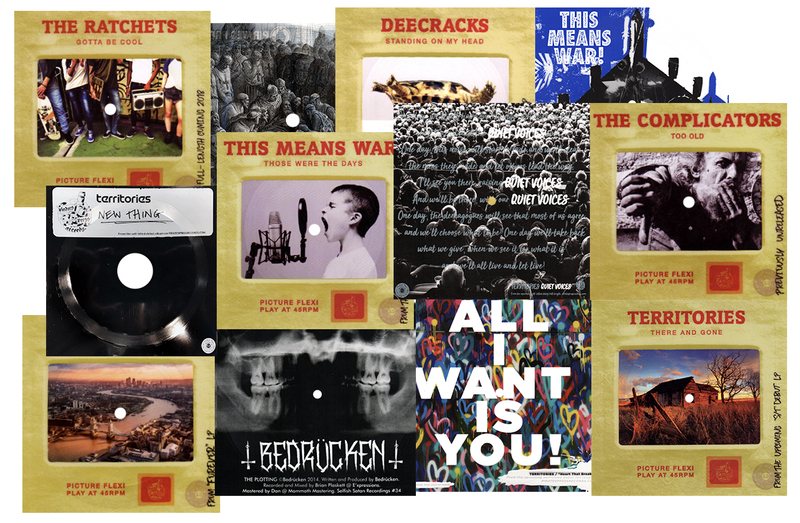 Flexi Specials - Get The Best Deals On Flexi Records From Pirates Press! 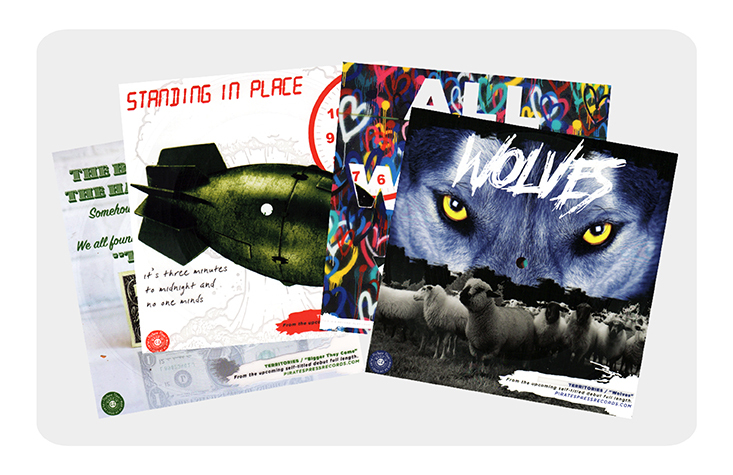 Flexi Specials - Get The Best Deals On Flexi Records From Pirates Press! Due to the overwhelming response, coupled with our desire to keep our production crew as busy as possible, we've decided to make some SPECIALS… to make it easier for you to order! If you would like a quote on something other than one of these packages, please EMAIL US with your potential order details and we'll be happy to get you an individual estimate as well. [Please note, our minimum is 250 units.] As we've mentioned in the past, we're pressing orders in a first come, first serve basis – production is limited, so we STRONGLY recommend getting us masters, artwork and order forms as soon as possible to ensure a quick turnaround! PICTURE FLEXIS are the hottest new trend. With grooves on the front, and printing on the back of transparent material, the potential is endless…and they sound AMAZING too. For record labels and bands, these are the MOST AFFORDABLE SINGLES you can make. You can create the best promo item ever; or sell them for that matter! 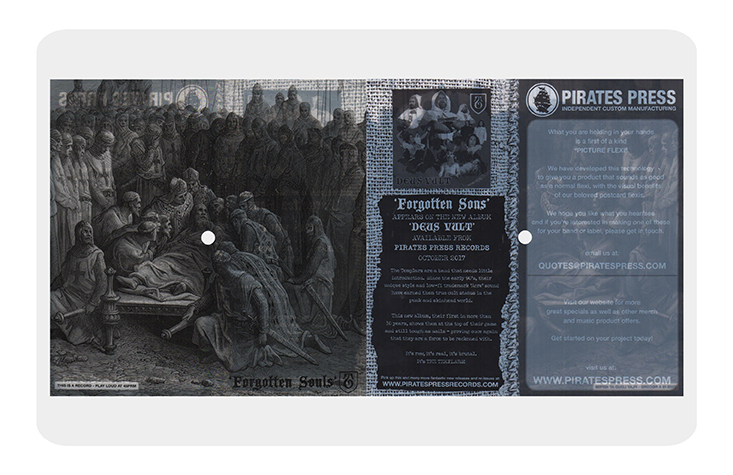 • Unlike our standard flexis, these allow for 7” x 7” artwork on both sides (audio only on one side). Unlike our Postcard Flexis, these sound FANTASTIC! • Magazines can sell the back as ad space to pay for the manufacturing of the flexis! An ad that people will actually keep and collect is priceless in the advertising world! PLEASE NOTE: For a very small surcharge, we can also add an additional layer of WHITE INK to help particular designs pop better. These can also be made slightly cheaper without white ink, although the colors will not seem as bright, as they will be significantly more transparent. *Please note: WHITE INK is not very opaque. It must be printed twice on these products, and counts as two colors in these specials. WANT IMAGES ON BOTH SIDES? …depending on your design, we may be able to print additional layers of ink and create spot printed picture flexis with images/art on both sides. Please email [email protected] for more info, options and pricing. While finding X-Rays to press on is nearly impossible, and the audio quality is HORRIBLE, we can EASILY make you imitation ‘bones’ that sound fantastic – Clear “PICTURE FLEXIS” with black UV printing on the back! For insertion into polybags, add $.15 each. 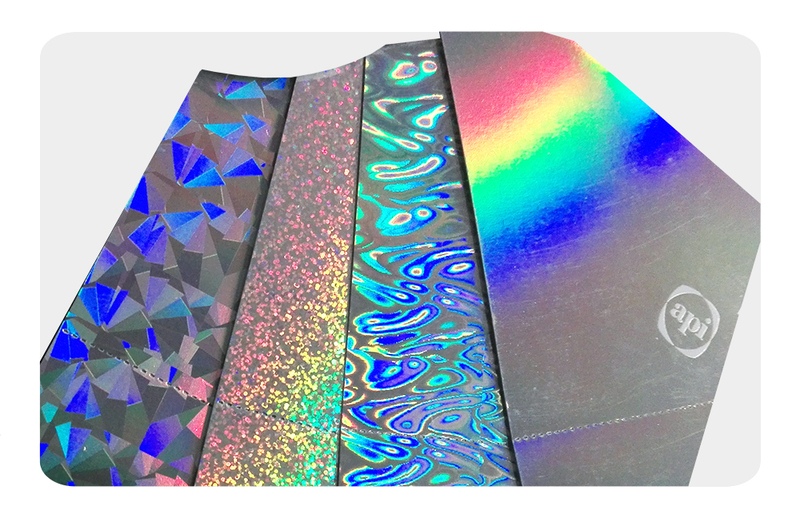 We have these unique RAINBOW FOILS for printing on flexi vinyl and also on paper and carton stock! They will absolutely make your product stand out among the rest! These rainbow foils were ordered for a special occasion and these foils can be used like any other. 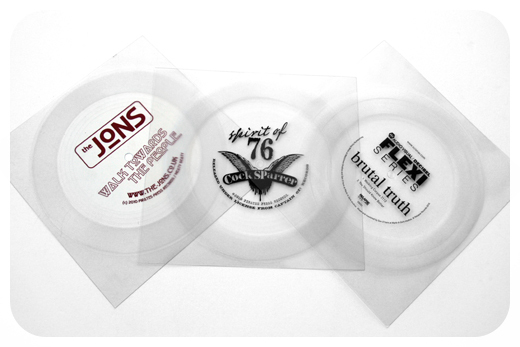 Includes all mastering, plating, 5 test pressings, and one-sided flexis with one-color label area stamping, cut into squares and inserted into polybags! 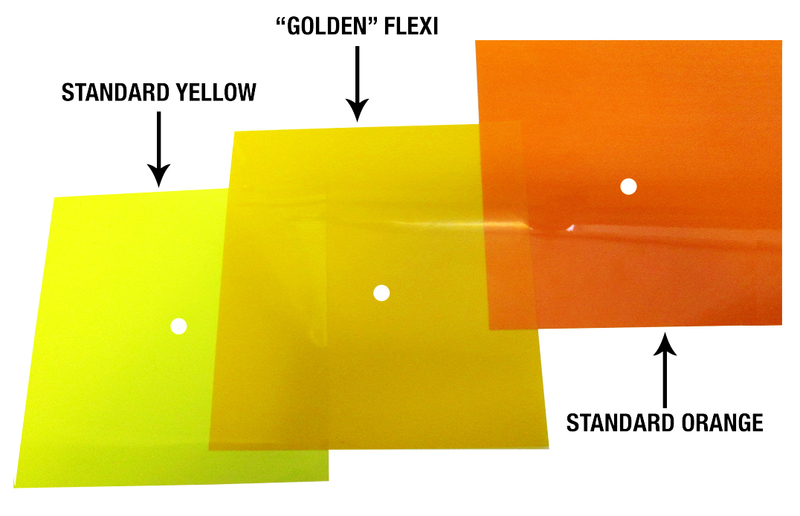 Available colors are translucent red, orange, yellow, green, blue, clear, or opaque black or white. These are one sided and maximum playing time is 6 minutes. Prices below are more geared towards inserting into magazines, so they include all the same as above, but instead of polybags, they're perforated for binding into a magazine! We also offer TWO SIDED FLEXIS! 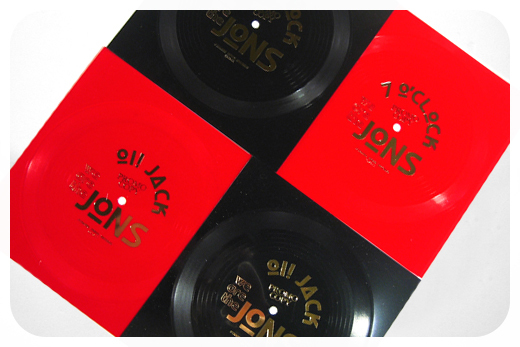 Includes all mastering, plating, 5 test pressings, and TWO-sided flexis with one-color label area stamping on one side, cut into squares and inserted into polybags! Available colors are translucent red, orange, yellow, green, blue, clear, or opaque black or white. Maximum playing time per side is 6 minutes and it's best if the sides are of roughly equal length. Note: Doublesided flexis can exhibit more playback issues than single sided flexis and do not tend to last as long. 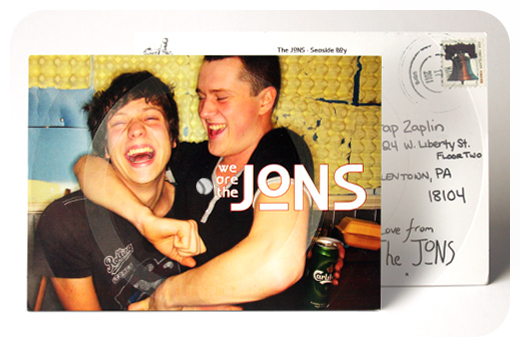 We're proud to announce that we've developed a process to make postcard flexis! 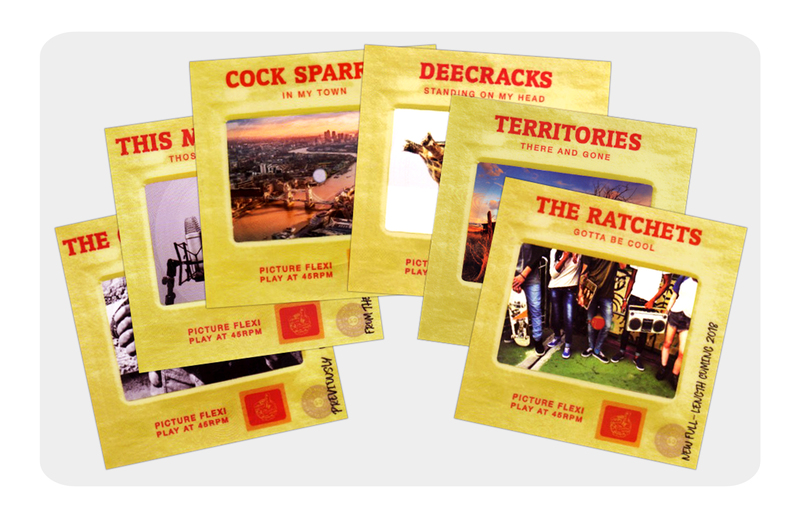 Our POSTCARD FLEXIS are playable full color postcards with grooves stamped in the glossy finish. 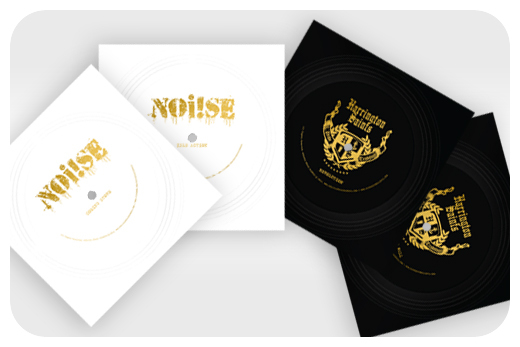 Regardless of genre, they are a great way to hand out a physical product that will NOT be discarded – but instead bragged about and flaunted heavily. 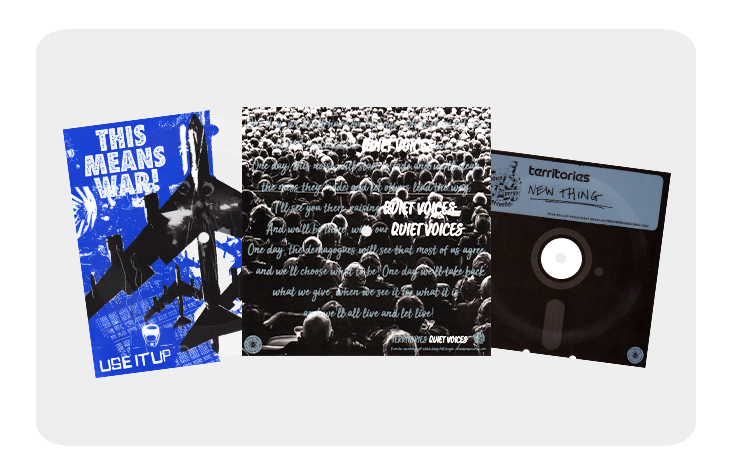 These specials include all mastering, plating, 5 test pressings, and a 5×7″ postcard (full color printing on one side, black and white on the back) with 5" grooves pressed onto the glossy full color side. Maximum playing time is 3 minutes. 7″ flexis that are over 6min (or over 2min for 5″) are prone to skipping and noise issues. We do have successes, but we cannot guarantee that they will not skip or have those issues if your master is over the recommended length. 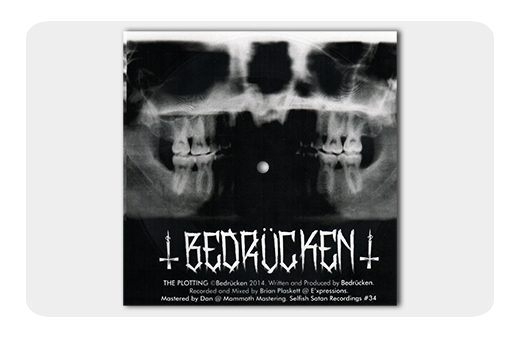 Includes all mastering, plating, 5 test pressings, and a 5×7* postcard (full color printing on one side, black and white on the back) with 5" grooves pressed onto the glossy full color side. Other postcard sizes are available upon request. Keep in mind that while the the sound quality of the normal flexis is pretty comparable to our normal records, these postcard flexis are pretty lo-fi, so the louder the tunes, the better! Below are links to the new accounts form (if you are a new customer, and need to set an account up with us), the flexi order form, the foil color chart, and the design templates; so you have everything you need all at once, for easy reference & ordering. Please feel free to hit us up if you have any other questions regarding the specials or any of the particulars. We press orderson a first come, first serve basis. Production is limited, so we STRONGLY recommend getting us masters, artwork and order forms as soon as possible to ensure a quick turnaround! quotes[at]piratespress[dot]com with your potential order details and we'll be happy to get you an individual estimate as well. Please note that our minimum quantity is 250pcs.